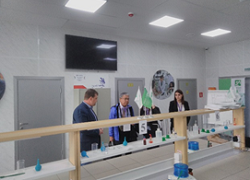 The Energy Conservation Center, Japan (ECCJ) dispatched two experts to the Smena (meaning “Change” in English) All-Russian National Children’s Center located in Sukko Village in the Anapa district of Krasnodar Krai, Russia during the four-day period between October 22 and 25, 2018, where the experts held an energy conservation seminar for junior and senior high school students. At the Japan-Russia Summit Meeting held in December 2016, it was determined that a “Year of Japan in Russia” and a “Year of Russia in Japan” would be held in 2018 as a part of measures to expand personal exchanges between the two countries. 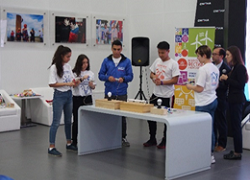 As part of these activities, following a request received from the Ministry of Energy and the Ministry of Education and Science of the Russian Federation, it was decided to conduct energy conservation courses while introducing Japanese culture to Russian children at three of the four all-Russian national children’s center locations, and ECCJ was placed in charge of implementing these activities. The summer school held this time took place in the Smena Children’s Center located in Sukko Village in the Anapa district of Krasnodar Krai. This was the third summer school following the ones held in June at the Okean Children’s Center in Vladivostok, Primorsky Krai and at the Orlyonok Children’s Center in Krasnodar Krai. ECCJ dispatched two experts, who conducted energy conservation courses three times, each lasting approximately two hours, which included quizzes, scientific demonstrations and group work in groups of five or six. 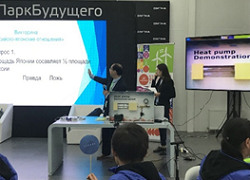 This activity contributed to Japanese-Russian energy conservation exchanges.